Welcome to Jamie Bakes Cakes! I’m a Mum of 3 beautiful girls, Poppy, Romy and Indie and am happily married to Mark. I have a passion for baking and have been lucky enough to do it as my full time job since February 2012. I’ve been very fortunate that my business has quickly grown, mainly based on recommendations, a fact that I am so proud of. I am constantly striving to learn new techniques and try new things to make my cakes even more delicious and beautiful, and have been lucky enough to learn with some amazing teachers such as Zoe Clark (The Cake Parlour, London), Tracy James (Cotton and Crumbs) and Natasha Collins (Nevie Pie Cakes). I started teaching my own classes in 2013 and absolutely love passing on the knowledge that I have picked up along the way. 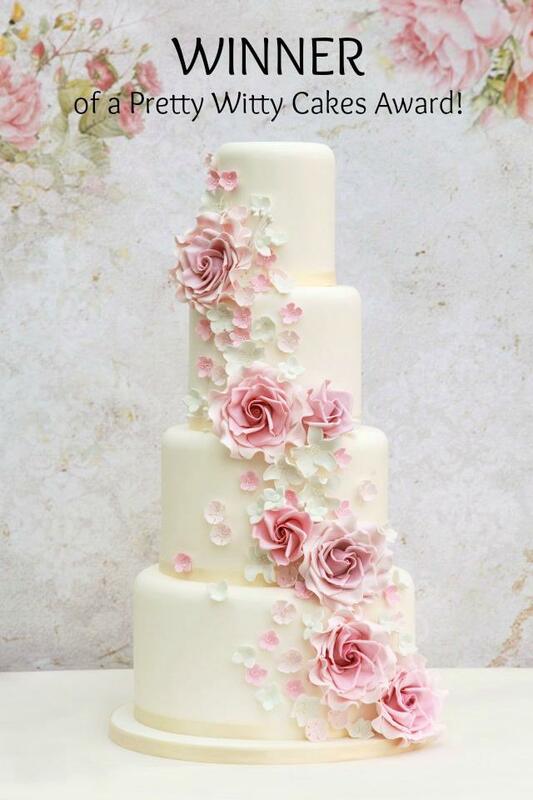 The same year I was overwhelmed to win an international wedding cake award with one of my most popular designs, Floral Cascade. I’m still so proud to be creating variations of this timeless style today. I offer a bespoke service to create a wedding cake you will truly love, personal to you and to complement your whole special day. A real talking point! I pride myself on the fact that my cakes taste as good as they look and I have a lovely, loyal client base of customers that come back to me time and again, and sing my praises to anyone who will listen! I can also cater for allergies, dairy free, egg free and gluten free. I am fully insured, hold all the relevant Food Hygiene Certificates, am fully compliant with Food Standards Agency regulations and hold a 5 star Food Hygiene rating from South Northamptonshire Council. Please take a look around and get in touch to see if I can create a stunning centrepiece to your celebrations. I am based in South Northampton but am happy to travel for those special occasions. 2019 now has very limited availability; I’m also taking 2020/21 wedding bookings so it really is never too soon to get in touch and secure your date. When time allows, I also teach aspects of baking and cake decorating. For a current list of classes and workshops with availability, and to book, please follow this link.